Thanks to Swiss Partners, SwissLink has now extended her Traditional on Campus Programs to also provide Online Studies option. Our Dual Mode Study Options ensure students can continue to benefit from our Swiss modeled Professional Quality Education irrespective of location. This Online Study Platform is sponsored by Google for Education. You will enjoy the robustness and stability of a Google Solution. 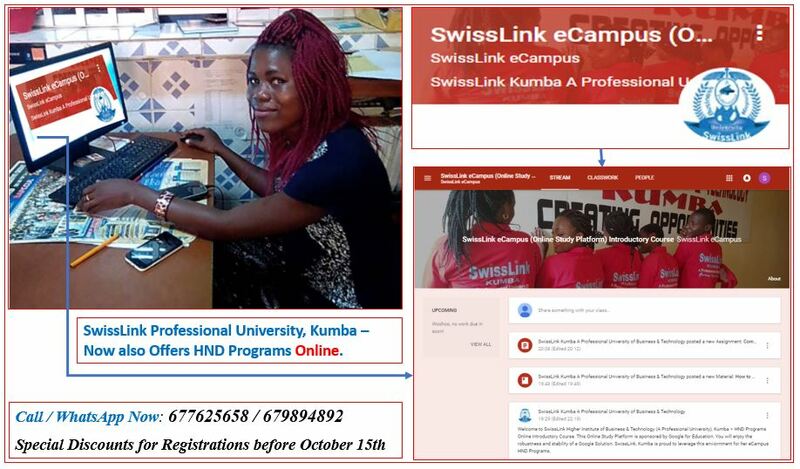 SwissLink, Kumba is proud to leverage this environment for her eCampus HND Programs. We leverage a collective strength from our affiliates in Switzerland, USA, and the UK which increase diversity. It is an opportunity to benefit from the contributions of both national and international resources. Our students will be exposed to high-quality services. Also, if you are a business interested in working with us we are here to help you grow. Note: SwissLink runs HND Programs in Business, Technology, and Education related disciplines. Education (Didactics, Educational Planning, & Curriculum Development). REQUIREMENTS: GCE A/Level in at least two (2) subjects, or its equivalent. SwissLink is Your Choice to International Career Empowerment.